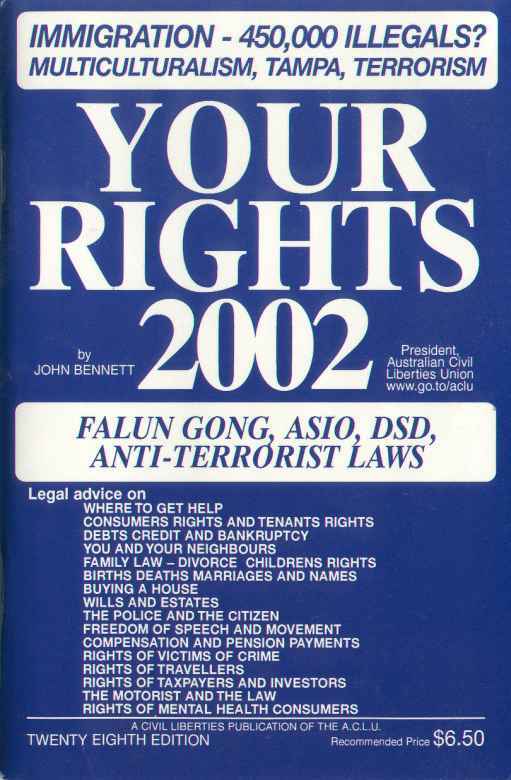 AIMS: The Australian Civil Liberties Union (ACLU) investigates and takes up matters involving arbitrary government actions, police conduct, freedom of speech, freedom of association, censorship of the internet, censorship of books and films, and invasions of privacy; gives general advice on citizens rights by phone and through its annual publication Your Rights ($6.50) available at newsagents, and campaigns for law reform. What is Discrimination? Definition of Terms. National Contacts. Emergency services. Police. legal Aid. Organizations. Dividing Fences. Encroaching Trees Excavations. Nuisance. Noise. Trespassers. Animals. Defamation. Mediation Centres. Advertising. Warranties. Appliance servicing. Door-to-door sales. Buying on credit. Buying a car. Dangers of credit. Time to pay debts. Court proceedings. Attachment of Wages. Seizure of Goods. Bankruptcy. Divorce. Maintenance. Parenting Orders. Rights of Children. Defactos. Domestic Violence. Stalking. Adoption. Births. Death Certificates. Funerals. Marriages. Changes of Names. Signing Documents. Finance. Interest subsidies. Grants. Station. Court hearing. The rights of shoppers. Street processions and offences. Indoor meetings. Censorship. Types of tenancy. Rent. Notice to Quit. Bonds. Eviction. Licensees. Making a Will. Appointing Executors. Probate Duty. Letters of Administration. Testatots Family Maintenance. A.C.L.U. policy Protection of Children and Property Physical attack. Evidence in Court. Compensation and Restitution. Travelling Overseas. Passports. Dual Nationality Insurance. Returning to Australia. Deportation. Citizenship. Tax rates. Deductions. Rebates. Records. Appeals Provisional Tax. Investment advisors. Types of investment. Risks. Sources of Information. Drivers licences. Cancellation. Road Law Insurance. Accidents. Mental Illness. Involuntary patients. Discharge. Reviews. ALP and ASIO Bill. NSW search powers. ASIO Bullies? While every care has been taken to ensure the advice is accurate there is no substitute for obtaining legal or other professional advice on the facts of each particular case. The law is often complex and it is difficult to express it adequately in a pamphlet or a website. Failure to seek advice will often be to your detriment. 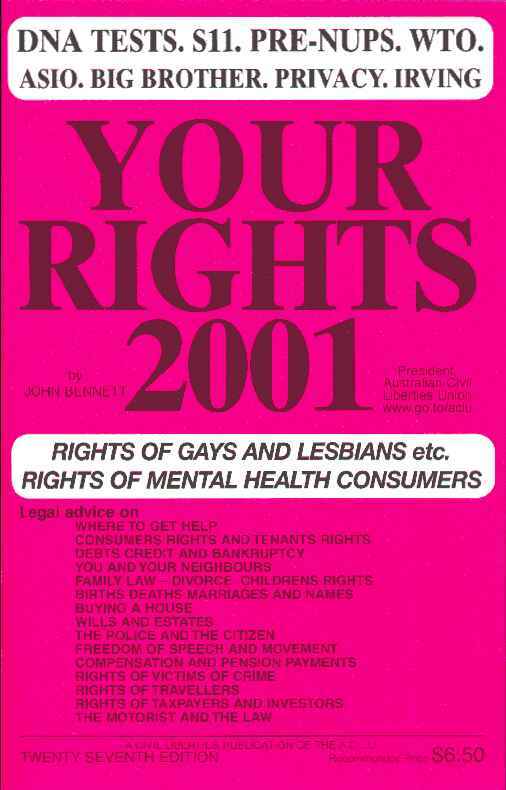 If you require legal advice but cannot afford such advice, approach a Legal Aid Service - see Where to get help - or read the book Your Rights 2005 , $6-50 at newsagents. New Chapters 1 through 18, containing updated material from Your Rights 2005! Australia - A Free Country? ACLU Policy Statements 2002 - DSD. Free speech for Public Servants. 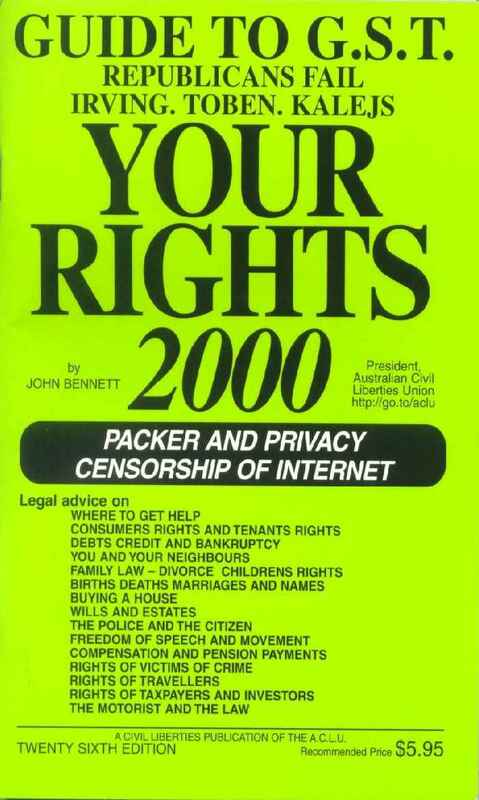 Free speech developments in 2001 - Media Watch. Rights of Demonstrators. Racial Vilification. Free Speech Victoria. Irving Libel Case. Adelaide Institute Website. 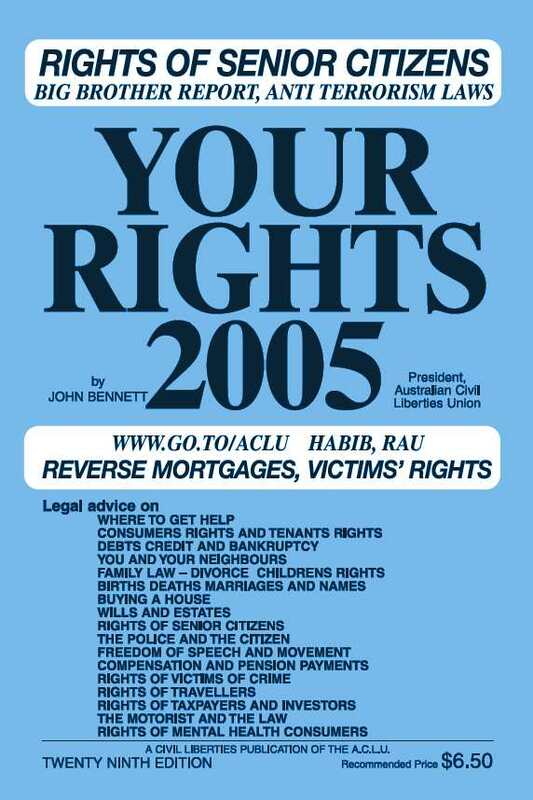 ACLU Annual Report. Big Brother Report, 2002 - Free speech. Phillip Adams. Freedom of information. 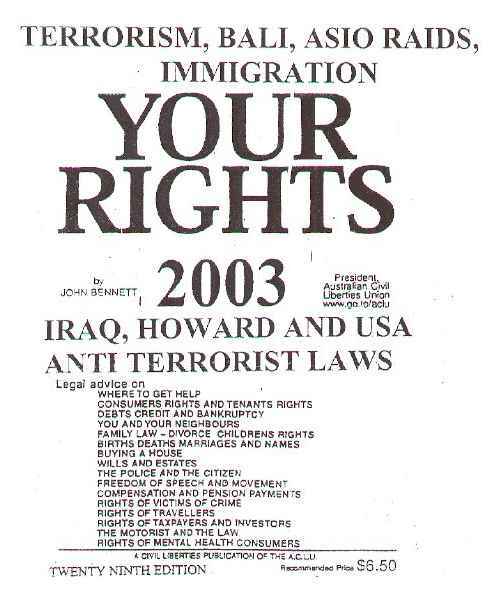 Howard�s new anti-terrorist laws. �Anti spy� laws threaten whistleblowers. "You are being watched�. Persecution of Falun Dafa (Falun Gong) followers by Chinese authorities in Australia. Big Brother Report, 2001 - DNA Tests. Crime Net. Camera Surveillance. Nanny State. Is CrimeNet A Threat To Civil Liberties? Windschuttle review: Geoff Muirden reviews "The Fabrication of Aboriginal History: Volume 1; Van Diemen's Land"